Westward Ho!, an example of American Exceptionalism. The beginning of a new year is a time to reflect on who we are, where we are going, and to express gratitude for where we have been. One of the things that we can be grateful for is our country. I think most of the world would agree that the founding of the United States in 1776 was, indeed, exceptional for the implementation of modern democracy, free markets, and freedom of expression. In the ensuing 240 years, we have also proven exceptional in other areas including innovation, wealth, private generosity, and others. Since the collapse of the Soviet Union, more of the world has moved toward the American model, including even Russia and China. That got me to thinking. What if another country takes our ideals, and implements them even better than we do, and then surpasses us in our strengths? It would present an interesting paradox. Would such a superior country disprove American Exceptionalism? Or would it vindicate everything that makes us exceptional? Westward Ho! 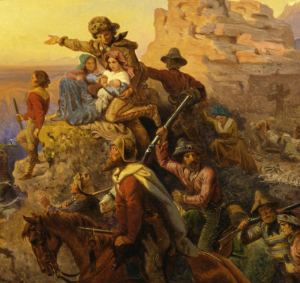 or Westward the Course of Empire Takes Its Way (1861, Emanuel Gottlieb Leutze), courtesy Wikimedia.org.